Your Blue Cruise may be your very first sailing holiday, or you may be a professional skipper. Our captain is an excellent instructor and if you want to learn more about sailing a gulet, or have a go at the wheel of an indigenous schooner rigged wooden yacht, this is the place. Or perhaps you wish to learn how to moor stern to, Mediterranean style. Our crew will be delighted to show you, and you may be as `hands-on`as you wish knowing that you’ll still be well fed and watered. The magic of a personal, family or group private gulet charter is about enjoying time with people of your choice, indulging in personal service, full housekeeping, gourmet meals, absolute relaxation and a very flexible itinerary. The gulet is ideal for a family wishing to sail the coast of Turkey, swim in secluded bays, enjoy lunches aboard to ashore, and meet the Turkish people. 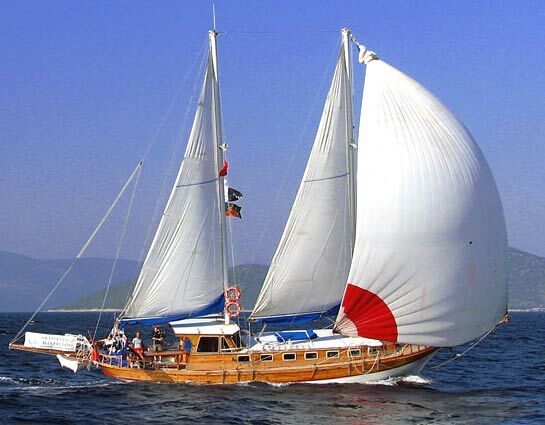 "M/S SOUTHERN CROSS" is an original classic Bodrum sailing gulet beautifully restored and updated. Eighteen metres long with four double cabins she is ideal for small groups or families looking for a sailing holiday. The two forward cabins have optional single bunk beds suitable for children. "Southern Cross" Timer provides comfortable accommodation for up to eight adults. Two bathrooms are located between cabins, with standard push flush marine toilets and handheld showerheads. Delightful Turkish/Mediterranean cuisine will be prepared for you on board and at the best local restaurants en-route. There is a choice of international-quality spirits and liqueurs and world famous Australian and Turkish wines. Your friendly Turkish crew will see to all your needs and they may call for volunteers when it comes time to hoist the sails. The crew of three will see to all of your needs, but they may call on volunteers when it comes time to hoist the sails after lunch. The M/S Southern Cross is ideal for small groups and families wishing a traditional sailing holiday. The food, hospitality and professionalism of our crew will be just as warm and accommodating as on our larger gulets, but without the fancier amenities you would expect with the higher end of the market. M/S Southern Cross is not a new gulet, but a completely restored original classic. For water sports: 1 canoe and snorkeling gear. Provisioning: Full-Board including Breakfast, Lunch, 5 o`clock Tee or Coffee, Dinner will be provided for 45,- Euro per Person / per day. Comfort/Recreation: Spacious sun deck area with sun mattresses and cushions, Sun awning, spacious dining area with bar and dining table. Accommodation Four double cabins for up to 8 guests. Forward two cabins have additional single berths. This Gulet has all together two bathrooms with electric toilets. extensions. Crew keen to sail and teach hands-on sailing. The M/S SOUTHERN CROSS meets international safety regulations including life jackets, fire extinguishers and alarms.